This is a trail camera picture of a headless whitetail deer. The image is a screenshot from a movie. 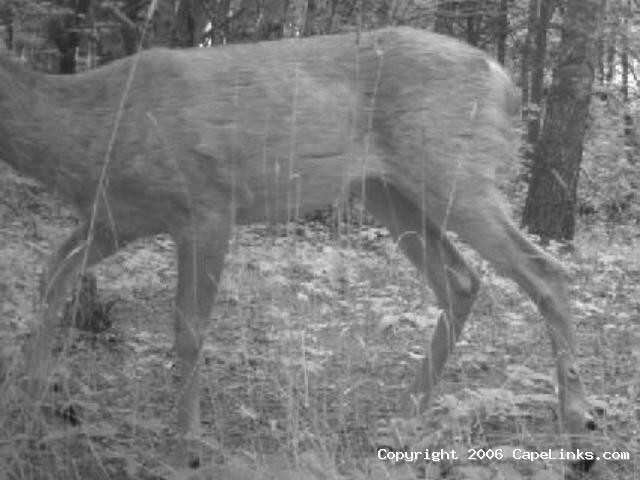 The deer was moving so fast that the trail camera only got this deer in the first few frames of the movie and did not get a head shot. Unfortunately you canâ€™t see in between the rear legs enough to make a gender call on this headless whitetail deer as it speeds by. This image has been viewed 9398 times and no comments have been submitted yet. You may leave a comment about this image. You can also view more Nature and Cape Cod images or learn more about Cape Cod.